Remote file access and browsing: Retrieve and view files from any computer in your SugarSync account. Local file management: You can browse and upload files stored directly on the phone. Allows you to copy and paste files to other folders, create new folders, rename files and folders, etc. On demand synchronization: Edit files directly on your phone (requires separate document editor application); SugarSync will detect file changes and prompt you to upload revisions back to the cloud and other computers. Shared folders: Send files and folders (small or large) to anyone and collaborate on projects through Shared Folders. 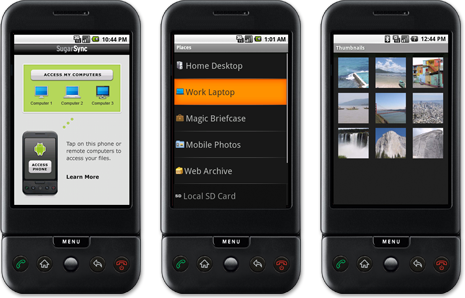 Browse photos stored on your computers in large or small format and directly upload photos taken with your Android camera phone. I took the Android version for a test drive earlier today and found it to work really well. I could access all of my backed up folders from my Macbook and, quite brilliantly, when you try to open a particular file you’re prompted to select which application on your Gphone should handle said file. For example, for an RTF text file I chose Android’s File Helper app and it just worked. One thing I was concious of was remembering to log out after using the app. With access to all of my Cloud storage, losing your phone would be that bit more serious. Overall, SugarSync have done a really neat job and probably deserve to be placed on my current top ten Android apps list.